江戸時代の終わり頃、天保元年（1830）に銀座で創業して、後に職人の町である京橋に移ってきたそうです。Thayne-san, today we’re visiting Shirokiya Denbei, a store specializing in brooms. 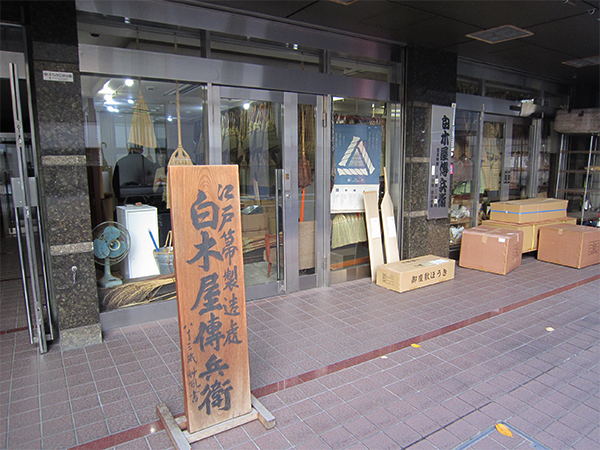 This store was established in Ginza in 1830, around the end of the Edo Period. It later moved to the artisan district of Kyobashi. オフィスビルが立ち並ぶ中央通りをちょっと入ったところに、老舗のほうき専門店があるということ自体が驚きです。 I’m surprised to see a traditional broom store like this in the middle of all the office buildings on Chuo-dori. Welcome, Thayne-san. I’m Nakamura of Shirokiya Denbei. Nice to meet you, Nakamura-san. I’m David Thayne. The walls of the store are lined with brooms. It’s fascinating. 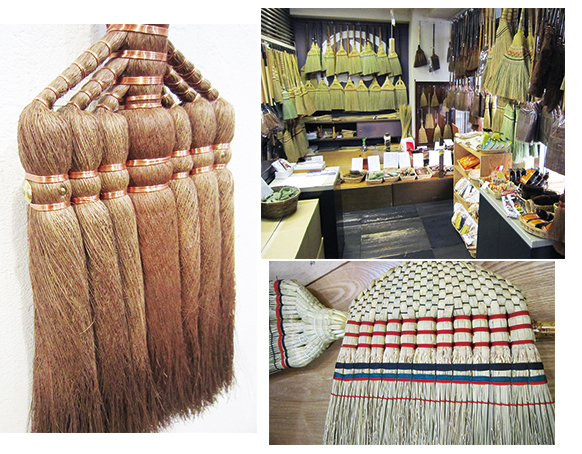 There are long-handled brooms, short-handled brooms, brooms in different shapes, and extremely elaborately woven brooms that look like works of art. （中村） どうぞ、ゆっくりご覧ください。そして、ぜひいろいろ持って重さを感じたり、掃き比べたりしてみてください。 Please, take a look around. Make sure you try holding the brooms to feel their weight and compare how they sweep. Ah! These brooms are the same size, but they feel completely different! That’s right. 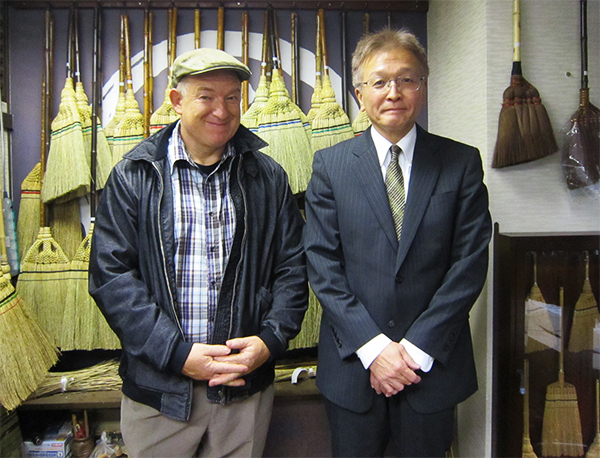 There’s no best broom, because it depends on things like the user’s height, or if it’s being used in a tatami room, a Western-style room or a garden. The best broom depends on the person and the purpose. But the most important thing to consider when choosing a broom is whether or not the balance is good. Even with brooms of the same length, people who have a higher center of gravity will feel that it’s heavy to use. The person using the broom should feel that it’s light so they won’t get tired no matter how much sweeping they do. I see! For a person with a lower center of gravity, a larger broom has better balance so it’s light and sweeps really smoothly. Yes. That’s the fundamental point. It’s something that’s used everyday, so it has to be user-friendly. It’s also important that it’s durable and can last a long time. When did people originally start using these brooms? The broom that Empress Koken is said to have used to sweep a silkworm room and pray for a bountiful harvest is kept in Nara’s Shosou-in treasure house, but it seems like brooms have always had those kinds of supernatural connotations. Up until around the start of World War II, you could also see people sweeping a new broom over a pregnant woman’s stomach as good luck for an easy birth. It’s an everyday item, but it also has spiritual powers! Brooms sure are curious tools. What kind of materials are used to make them? Various materials like hemp palm, bamboo and straw are used, but for Edo brooms that are used in tatami rooms, we use a plant called broom corn. Tatami became common in everyday people’s houses from the middle of the Edo Period, but the brooms made of hemp palm and scoparia grass used up until then were unsuitable for use on tatami because they were too stiff and left granules everywhere. Therefore, we started using broom corn. It’s a soft plant and it’s also springy, so you can sweep very quickly. We started calling the brooms made of broom corn Edo brooms, and that’s been our trade ever since. Edo brooms are very flexible, so they’re great for reaching into corners and sweeping steps as well as picking up small pieces of dirt. If you sweep your tatami with them every day, it will bring out the luster. They also don’t kick up dust like a vacuum cleaner does, and there’s no electricity cost. Even if you use one everyday, it will last for five or six years. Even if the bristle tips become damaged, you can continue to use it on wooden floors, dirt floors or outside in the garden. Also it doesn’t cost anything to dispose of, unlike vacuum cleaners! Where does the broom corn come from? In our case, we asked farmers living at the foot of Mount Tsukuba to grow it for us, but domestically produced broom corn is scarce. Lots of it comes from overseas. We import it from places like northern Thailand where it’s cultivated. 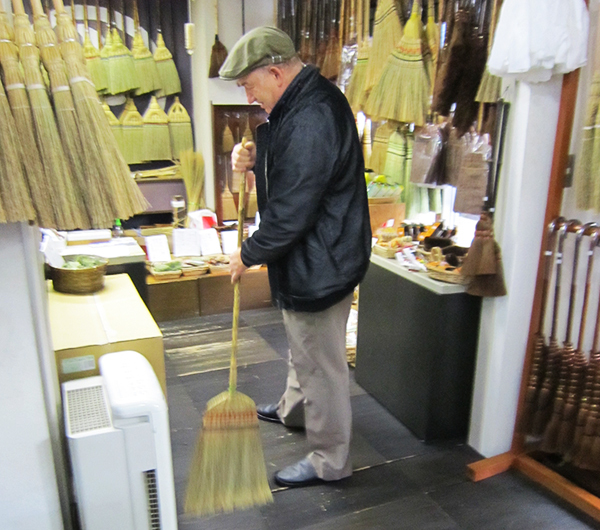 Is the number of craftsmen making brooms decreasing, what with the aging society problem? At the moment, we’re doing okay. We have craftsmen in their 20s and 30s as well as some young women. Everyone is working well. The most difficult thing about making brooms is choosing the right materials. 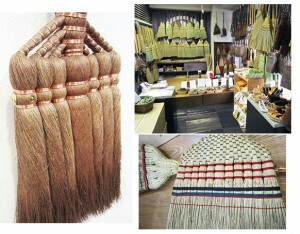 To put it another way, the materials are what make the Edo broom. Therefore, there are great craftsmen, but there are also great connoisseurs. A lot of experience is necessary to gain an eye for choosing materials. That’s something that’s handed down through the generations and is the fundamental part of what we do at Shirokiya Denbei. I see! I’m starting to understand just how amazing this shop is. Actually, the post-war years were a bad time for the broom industry. At the same time as vacuum cleaners were starting to be used, brooms came to be seen as old-fashioned and inferior. The number of shops dealing with brooms became fewer and fewer, and we were worried that our shop might also not survive. However, eventually we started to get new customers who had allergies. Since brooms don’t kick up dust the way that vacuum cleaners do, there started to be a demand for brooms once more. We decided to show these people the most effective way to use a broom. Meanwhile, brooms started to catch the attention of young people. They’re eco-friendly, hygienic and don’t take up much space. The best thing is that when you find some dirt, you can quickly get out your broom and sweep it up there and then, and you’re done! It’s very convenient. For people who were born after vacuum cleaners were a common thing, they aren’t really considered to be valuable objects. Such people can appreciate the advantages–and beauty–of simple tools like brooms. I’d like to let people overseas know how wonderful these brooms are. I will! Thank you for your time today!